From humble beginnings in El Salvador to becoming the best race-walker in the Americas, the journey of Cristina Lopez to become a Panam Sports Legend was filled with challenges and triumphs. It did not take long for Cristina Lopez to find her calling in sport. At just 18 years old, Lopez ascended to become the top junior race-walker in El Salvador, competing in the World Junior Championships in 2000 where she finished in 20th place in the 10,000 meter competition. Her potential in the sport quickly became clear in 2001, winning gold medals in both the Central American and Pan American Junior Championships before going on to win the bronze medal in the 20km event at the Central American Games in Ciudad de Guatemala. Over the next several years, Cristina’s regional dominance in the sport began to grow. Gold medals from the Pan American Race Walking Cup and the Central American and Caribbean Championships of 2005 would only lead to greater accomplishments in 2006 and 2007. After winning the bronze medal at her first regional Games in 2001, Lopez was ready to elevate her performance to the next level. 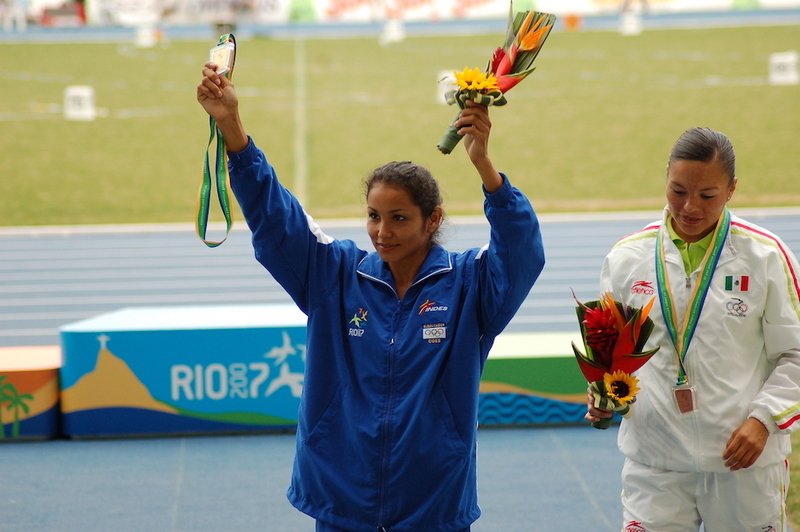 At the Cartagena 2006 Central American and Caribbean Games in Colombia, the speedster from El Salvador won her first gold medal at a regional Games. But the best was yet to come. In 2007, Cristina went undefeated in major regional competitions, earning two more gold medals at the Pan American Race Walking Cup and NACAC Championships. These victories prepared her for the biggest test of her career that would come later that year. In July 2007, Lopez joined 85 of the best athletes from El Salvador to compete in the continent’s greatest sporting event, the Pan American Games. Prior to the Rio 2007 Pan Am Games, El Salvador had never won a gold medal at the continental event, but that was about to change. Despite concerns about the health of her young daughter back home in El Salvador, Cristina was able to focus on putting forth one of the best races of her career, dominating the competition to win the gold medal in the 20km Racewalk. She finished a full minute and four seconds ahead of the silver medalist. The historic performance will always be remembered in El Salvador as Lopez claimed the nation’s first ever gold medal at the Pan American Games after competing in each edition since the inaugural Games in 1951. The incredible race also inspired her teammates to the country’s best ever finish at the Pan Am Games, earning 10 total medals, nearly half of the country’s 22 in history. Lopez continued competing in her beloved sport through the Toronto 2015 Pan American Games where she placed 13th. She went on to win several more gold medals at regional and sub-regional events throughout the Americas during her storied career. Cristina Lopez will never be forgotten as the first Pan American Games Champion for El Salvador, making her yet another Panam Sports Legend.